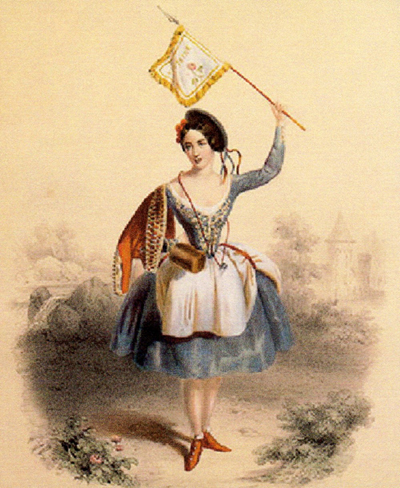 Fanny Cerrito and her patriotic "Sicilienne"
From the Gazzetta di Venezia: on the evening of february 6th 1848 Fanny Cerrito, while playing in La Vivandiera e il Postiglione at the Teatro la Fenice, inserts a Sicilienne as a homage to the sicilian revolutionary movement, unleashing the ardour of the audience that shout «Viva la Sicilia! Viva i Siciliani!». Delirious applause ensues for Cerrito when she «appears onstage shrouded in a white, red and green voile».